Just like many other places in the northern hemisphere of the world, we've experienced very hot summer here in LA this year. Now September is almost ending, but we are still experiencing unusually hot weather for the season. So, the good thing is that in the past weeks, it takes very short time to make nice sun-dried mushrooms. In the wintertime, I normally let them sun-dry at least 1 full day or 2 days. 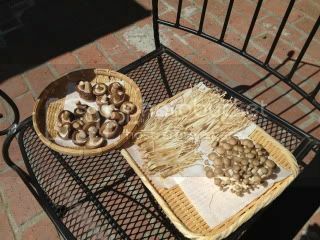 But, just 4 hours of sunbathing in the morning make the nice semi-dry mushrooms. With these mushrooms, you can make a wonderful appetizer. So, here's the recipe. 1. Cut and discard the bottom part of the mushrooms. 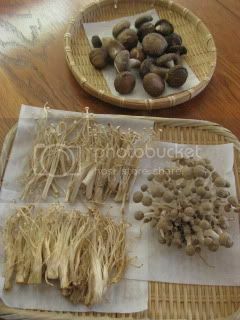 Sun-dry the mushrooms until semi-dry (half day to full day). 2. Saute onion and garlic in 2T olive oil over medium-low heat until the onion is very soft (about 5-7 minutes). 3. Turn up the heat to medium. 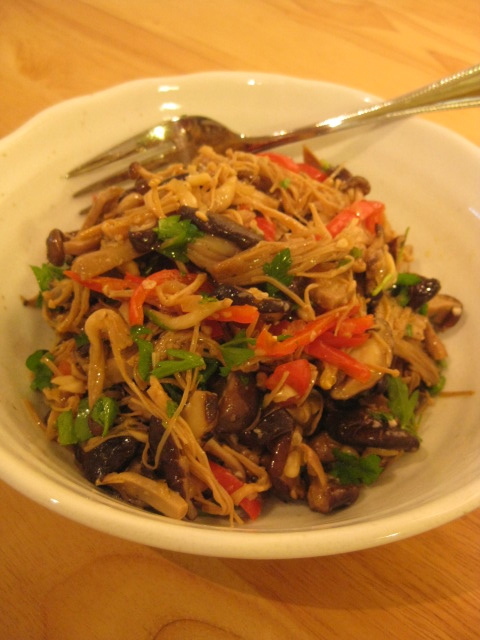 Add the mushrooms and bell pepper, and continue to saute for a few minutes. 4. Add the sake and water. All add the vegetable stock powder. Cover and steam-fry for 5 minutes. 5. Once the liquid is reduced down to almost nothing, add the shio-koji, and also season with salt (if necessary) and pepper. Stir. 6. Add the lemon juice and remaining olive oil. Add the pine nuts and sliced dry red chili. Stir again. Turn off the heat. 7. Once the mushrooms are cooled down. Add the parsley and stir again. Serve immediately or you can refrigerate and keep for 2-3 days. Bring it back to room temperature to serve.